Show your support for Marathoning or Half-Marathoning with our Special Edition Marathon Decal compression sleeve. Sports compression sleeves provide ankle-to-calf graduated compression, best for athletes who do not wish to change from their current running or riding socks - but still want the protection and improvement a graduated compression garment offers. Use the Compression Sleeve in conjunction with your favorite socks to improve endurance by boosting blood circulation and delivery of oxygen to your muscles. Comfortable and good support, at a very reasonable price. Especially during spring and summer, I prefer to wear these, with cotton socks. I believe this is one of the reasons I was able to clear up some persistent toe fungus. I wear compression stockings because of CVI (chronic vein insufficiency), so I wear them every day, all day long. I love all the Mojo sleeves and stockings. These sleeves with the decal are very easy to put on, and they don't feel like they have the same tight compression while on my legs as the other styles. They are still fine, and I'll wear them till they wear out, but I can see that the other styles are made with a tighter weave, something I need for my condition. I am a short woman (5'1"), and the small size fits me perfectly, just the right height for my short legs. Great price! The material is good quality, not thin or too tight and is easy to put on. It supports my calf after longs runs like any other expensive compression sleeves brands. One slight problem is that the sleeves for me is a bit short by one (1) inch but overall its a great pair of sleeves and the price is awesome. 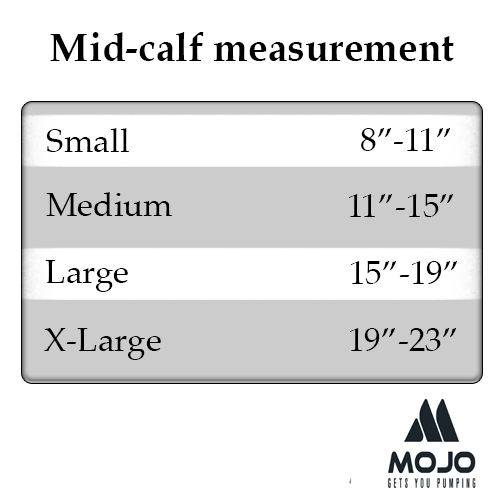 Of the Mojo sleeves i have this is among my favorites because it is made of a lighter-weight material than the others. I gave it a 4 because as with most sleeves the ankle band is not very comfortable.